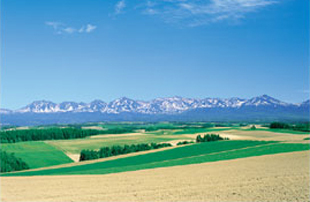 Biei is a member of the " most beautiful villages in Japan", having four distinct seasons, rolling hills filled with color, and Hokkaido's stunning Taisetsu Mountain Range on its horizon. As a photographer, Sunichi Abe was fascinated by the incredible scenery of Biei and decided to move to Biei in 2001 from Kobe. His unedited (raw) square photos of Biei capture the scenery of Biei in all its moods. The photos are filled with a unique depth that makes you want to experience Biei during every season and come back over and over again. Mr. Abe's gallery can be found at the front of the pyramid shaped observatory in the Northwestern Hill Observatory Park. The viewing area allows you to see beautiful panoramic view of the Taisetsu Mountain Range behind Biei’s rolling hills, while at the gallery you are able to purchase post cards, calendars, and photos amongst other things. 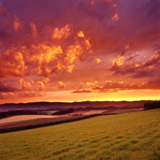 The post card pack contains 12 photos, four from each season under the title “Landscape of Biei”. Mr. Abe and his wife are 'Biei professionals'. They will welcome you, recommend places to go, places to eat, tell you the way to the best picture taking locations, and give you plenty of other Biei local information. Shunichi Abe's photos have been used in travel guides, travel magazines and official Biei Tourism Brochures. He is a member of Japan's Professional Photographers Society and a member of the Photographic Society of Japan. 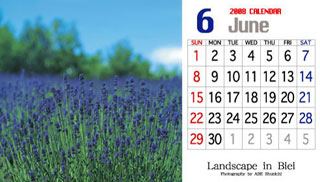 These beautiful 180mm x 110mm desktop calendars depict the changing scenery of Biei from month to month. 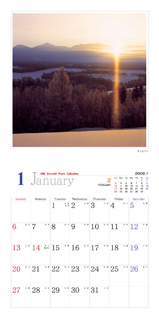 They are available at the Shunichi Abe gallery in Biei as well as Asahikawa Tourism in the city and make a perfect addition to your office, home, or home office.